Böllhoff, one of the leading international providers of fastening and assembly technologies, and KUKA, one of the leading international providers of automated production and assembly solutions, decided to embark on a new cooperation and jointly develop a project: the ready2_rivet package. Work in production halls is presently undergoing a change. The reason for that is the increasingly global competition and changed market demand. Product life cycles are becoming shorter. That is also true for the automotive sector, of course. Alternating model series require quick and flexible solutions. However, lightweight construction, the technology of today and tomorrow to save material and energy, also demands for expert knowledge. Especially the automotive industry cannot do without them: modern lightweight concepts. On the contrary. Not only do they considerably improve vehicle dynamics, but they also help to reduce emissions. Lightweight construction continues to be essential for future cars and is also important for e-mobility. Though, lightweight construction also sets high standards for multi-material concepts thus requiring innovative fastening technologies. With many of its technologies, Böllhoff already addresses modern body construction with distinctive material combination today. They offer a great potential of productive solutions providing key technologies for mechanical fastening. One of those, the self-pierce riveting technology with semi-tubular rivets, RIVSET® Automation EH, allows to join lightweight materials as well as high-strength steels at very short process times. The material components do not require pre-drilling or pre-punching. In one step, the semi-tubular rivet punches through the top material layers and in the bottom material layer forms an undercut and also the characteristic locking head. This process convinces by relatively high dynamic and quasi-static strengths and high reproducibility. It is also easy to automate. For this system, the focus is on functionality, variability and design. With a long life at maximum availability and minimum maintenance, this is the foundation for a successful production. Böllhoff permanently pursues the further development and thus always has the answer to current industry trends. In close cooperation with KUKA, Böllhoff has developed an automated and flexible turnkey solution. Harmonised, pre-configured systems which require only little preparation and are easy to operate are the result. Both parties contributed their know-how of the automotive sector and with their specific expertise in the robot and joining technologies launched a competitive product: the ready2_rivet package. Industry-specific, industry-tested and immediately ready to use: that is the ready2_rivet package. 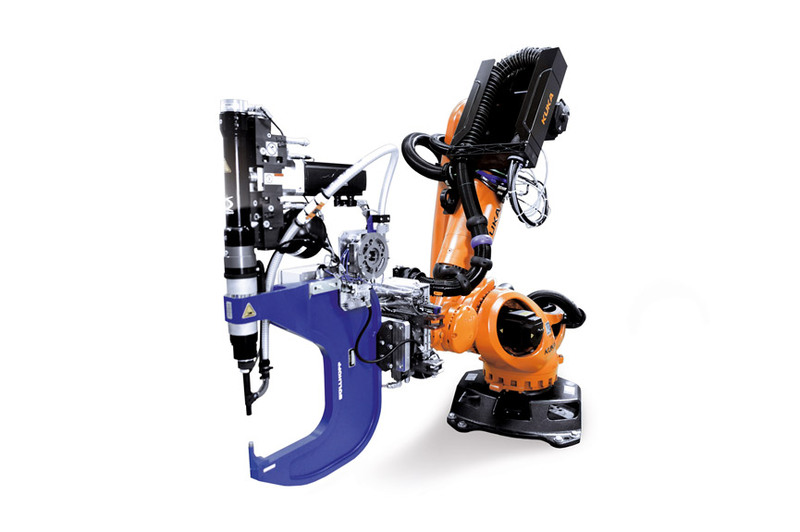 The robot is a KUKA Quantec-series robot, same as the robot control. 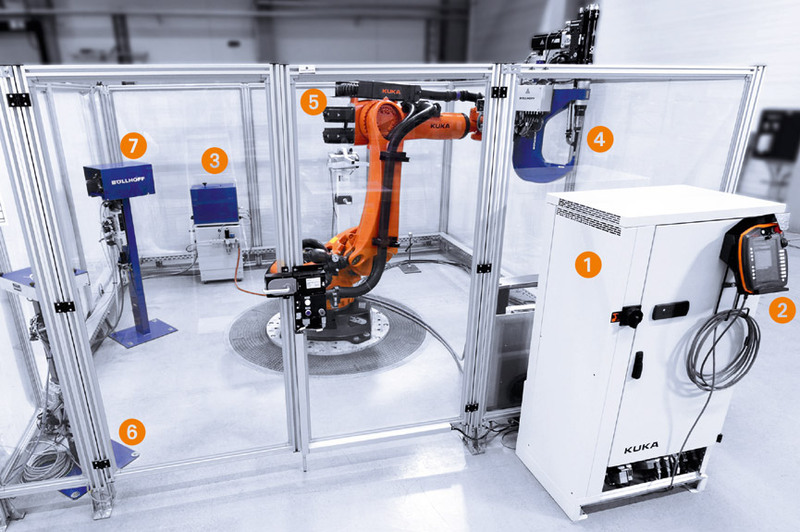 This KUKA KR C4 convinces by worldwide compatibility: It functions reliably at different voltages and network configurations and also in extremely cold, hot or humid surroundings. It understands 25 languages – among them also the important Asian languages – and fulfils all relevant international ISO and US standards. Böllhoff supplies the technology for self-pierce riveting RIVSET®. It can be seamlessly integrated into existing production environments. Due to the modular design, it is practically made for applications in large-scale production with maximum flexibility in production planning. The long life at maximum availability and minimum maintenance are two of the keys to success. With the KUKA SmartPad, it is easy and intuitive to operate even for inexperienced users. In that case, the KUKA SmartPad also simplifies the use and supports the process control of the overall system. Böllhoff provides support in form of application components. Böllhoff and KUKA, both experts in their fields of expertise, provide their customers with a product of real added value. Ready2_rivet is always adaptable and can rise to new challenges – just what Industry 4.0 asks for. Overall, the customers of both companies benefit from an increase in productivity and efficiency which, on the other hand, is just what both companies are striving for because they regard themselves as their customers’ partners. The ready2_rivet package from Böllhoff and KUKA comprises all the important components.